Guitar strings need to be changed periodically due to popping and normal wear, which dulls the sound. You can attach new strings in a matter of minutes. 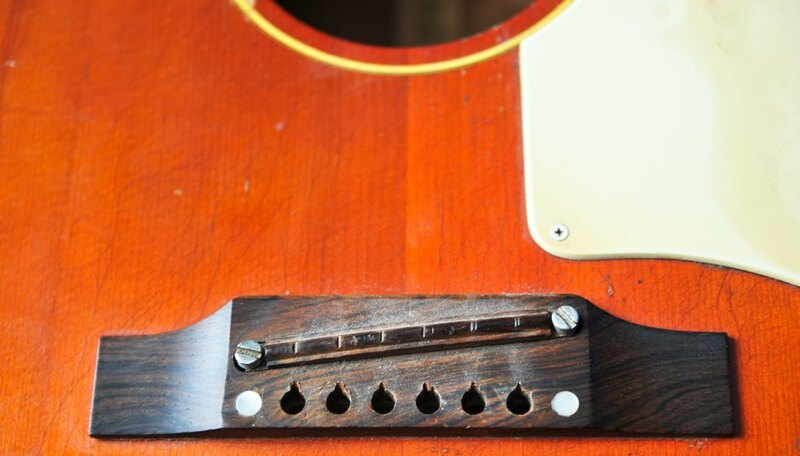 Your guitar will sound crisp and clear once you perform this simple task. 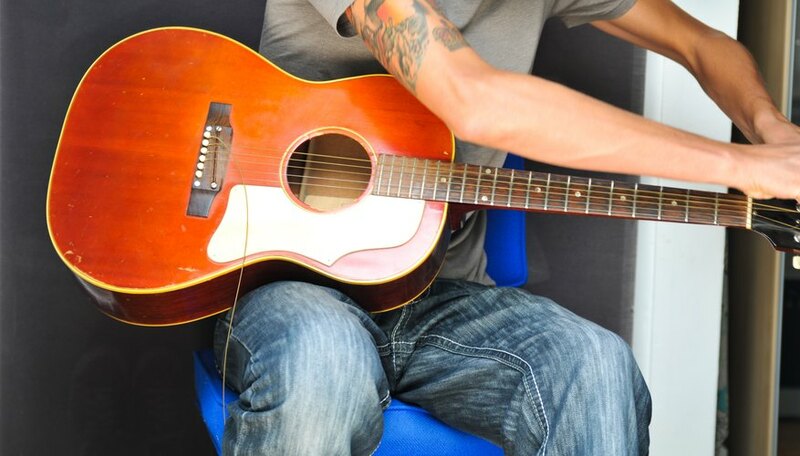 Make sure that you are using acoustic strings if your instrument is acoustic and electric strings if it's electric. You can choose from different gauges of strings—light, medium and heavy. The lighter the string, the easier it is on your fingers. The heavier the string, the louder the sound rings out. Remove any old strings from the guitar. In order to do this, unwind the strings from the tuning keys at the top of the instrument. A guitar winder is a small tool that makes this task much easier and quicker. The winder attaches to the tuning key and allows you to turn it much more efficiently. Inspect the saddle of the guitar. This is the part near the base of the instrument where the strings are attached at the opposite end from the head. Your strings may be running up through tiny holes in the saddle. If so, grasp the circular piece of metal on the far side of the saddle and simply pull the string back out through the hole. 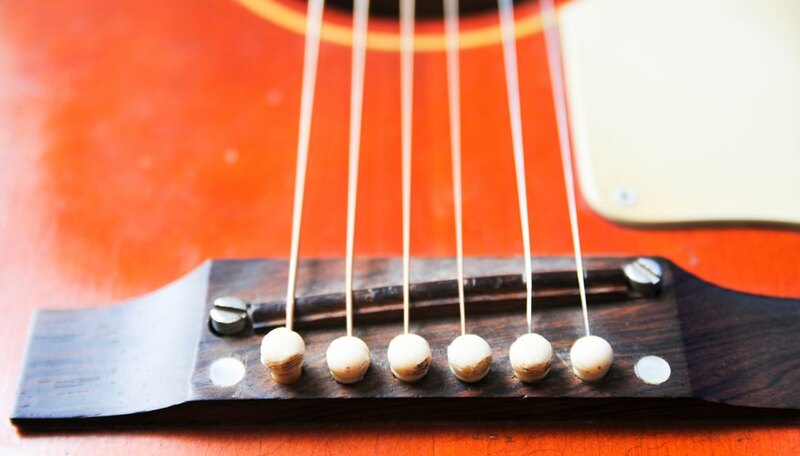 Some guitars secure their strings with pegs toward the bottom of the instrument. If this is the case, pull out the pegs, and the strings will come free. Attach the first new string. Start with the lightest gauge string, which is the thinnest one. This is the high E string. 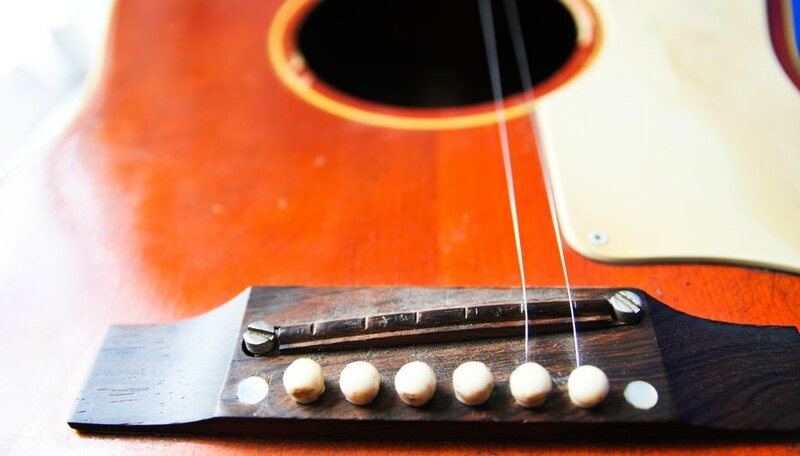 If your guitar has pegs for holding down the strings, place the bottom end of the string (the part that's attached to the circular piece of metal) down in the hole. Slide the peg back in, and pull the string tight while holding the peg down. If your guitar doesn't have these pegs, run the top end of the string up through the tiny hole in the saddle. When looking directly at the saddle, this will be the farthest hole to the right. Secure the string by running it through the hole in the bottom right tuning key. After the string extends from the key by 1 or 2 inches, begin turning the key to tighten the string. Tighten until there is no more slack in the string. Again, this process is much easier when using the winder tool. Repeat this process with the remaining strings, proceeding from the lightest gauge string to the heaviest. The other five strings are strung as follows: the B string goes from the second hole on the right half of the saddle to the middle tuning key on the right; the G string goes from the third hole from the right of the saddle to the top right tuning key; the D string runs from the third hole to the left of the saddle up to the top left tuning key; the A string goes from the second hole on the left half of the saddle to the middle left tuning key; and the Low E string runs from the first hole on the left side of the saddle to the bottom left tuning key. Tune the strings. Once all the strings are in place and you've wound them tight enough to remove the slack, it's time to tune. 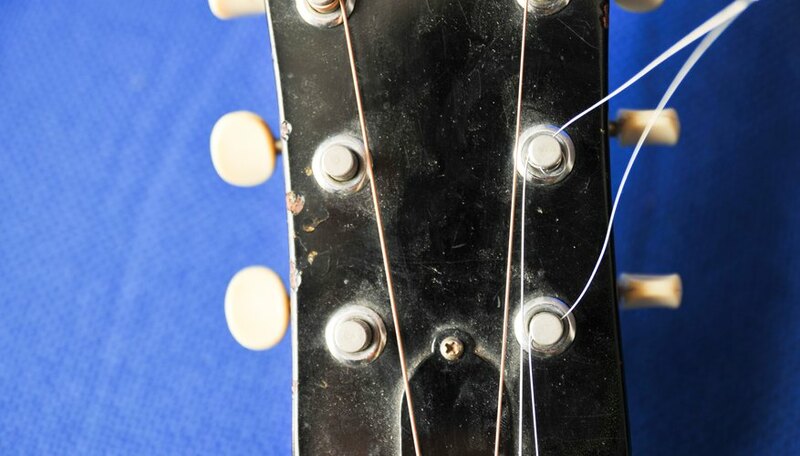 Tighten or loosen the strings until each one is the right pitch. The easiest way to do this is by using an electronic tuner. If you don't have one, you can tune by matching the pitches of another instrument. One other method is to match the pitches of an online assistant (see the Resources section).